The Easy WebContent reseller program is the perfect solution to meet your customer’s website editing needs and gives your business a completely new recurring revenue source. 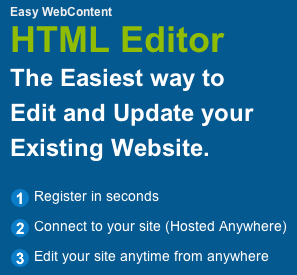 Suppose you already have an existing website that is out-of-date and you want to do some revitalizing, an HTML Editor is perfect for you. It allows you to edit and maintain your website easily from ANY browser on ANY computer. You don’t have to pay for extras and don’t have to worry about downloads; you don’t even need any special knowledge. It’s the tool that’s made easy just for you. After you set-up access to your page, you can go in and edit any text, tables, images, or media; there are literally no limits. It even allows you to edit pages you may have linked to your website. And to top it all off you can add pages to your site. 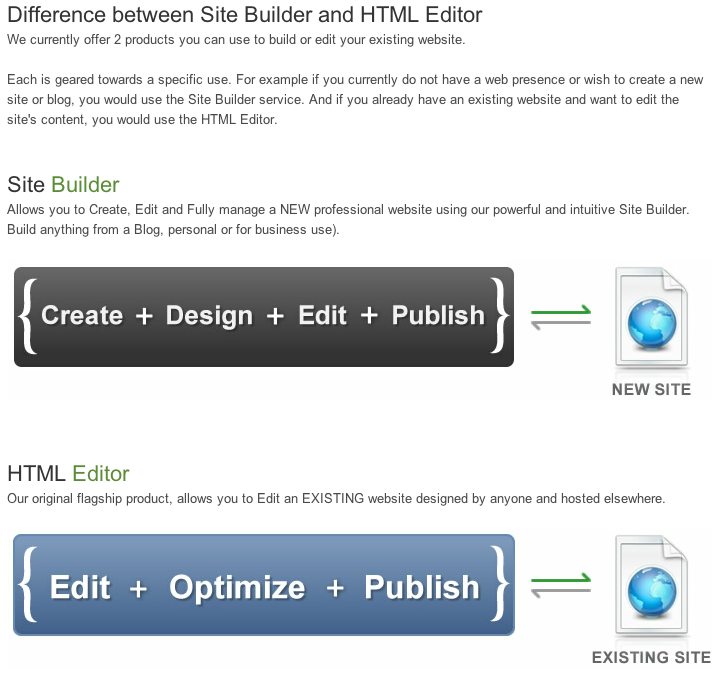 Beyond that, the HTML Editor offers many add-ons and widgets to personalize your website and make it more modern and inviting to viewers. For example, carousels are a fun way to display items, pictures, text, etc. on your page; having them as a click through even makes it more interactive. The Easy WebContent Flash Maker add-on is also a great feature to update any website. It enables you to create custom Flash banners, slideshows, and graphics, which makes any website look extra professional. Now, I know this might seem difficult, but it really isn’t. The Music Player Add-on allows you to create music to play on your page when your audience visits. It helps set the tone for your business. For example, if you’re a radio station featuring an up-and-coming artist, you can ensure that everyone that visits your website hears their first single! Now that’s great exposure for your business and the featured artist. 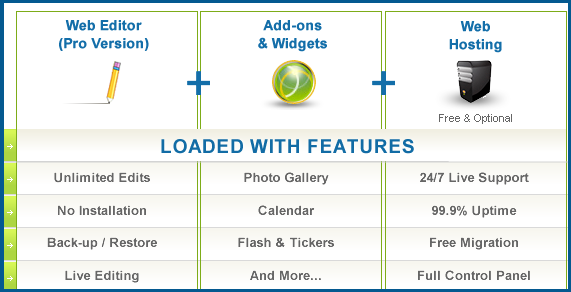 Easy WebContent makes all of their add-ons and widgets user-friendly, even for very new beginners. In addition to this, video tutorials along with text directions are posted to ensure you have the best experience with every feature. The list of features goes on and on from image editors to site maps; Easy WebContent gives unlimited opportunities to create the best website for you. Each add-on comes with different elastic templates, so it never looks generic, it matches your page’s theme, and you can change it as many times as you’d like. In today’s age of social networking, where everyone loves to personalize their sites to their liking Easy WebContent’s HTML Editor is the perfect tool. No one wants their website to look like someone else’s and why would it have to? We all hate going to a website and being bored, don’t subject your audience to that suffering. Sign up today!!! It only takes a few moments to complete and receive your welcome letter via email within minutes. Then, you can immediately login to access your account and start having fun creating a fresh, new website!